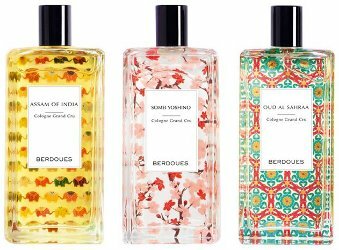 French perfume house Berdoues has introduced Colognes Grand Crus, a collection of six Eaux de Cologne inspired by world locations and materials. Assam of India (above left) ~ based on low altitude black Assam tea from India, with citron and sandalwood. Somei Yoshino (above center) ~ a cherry blossom fragrance inspired by Japan, with additional notes of shiso, jasmine and patchouli. Oud al Sahraa (above right) ~ an oud fragrance, with mandarin and myrrh. Arz El-Rab ~ inspired by the cedars of Mount Lebanon, with ginger and iris. Selva do Brazil ~ the vivacity of Brazil, with petitgrain, tonka bean and gaiac wood. Scorza Di Sicilia ~ the citrus of Sicily, with lemon, cedar and vetiver. The Berdoues Colognes Grand Crus can be found now at Nocibe or News Parfums in France, 100 ml each. They’re fantastic — I’d love to have the whole set, but really want Assam with those elephants. Lovely Robin, I am currently in France on extended holiday (yes, again!!! )- I’m back in NY in mid-July. I just ordered 2 bottles of the Assam to be sent to my Nice area address, 1 for me (because I love this type of scent and the bottle is quite nice) and I will happily send the 2nd bottle to you, no charge. Nocibe actually has 25% off, so it works. I already have your address in an email somewhere. Sorry you’ll have to wait so long but at least it’s a fragrant something you have to look forward to! Hugs, Julien. J, wow, I am speechless. That was incredibly kind, thank you! Yes – the bottles are amazing! I want them all. I don’t even LIKE cologne, and I want these for the bottles. Brazil sounds especially nice. I never even heard of this company, but these all sound nice and I also like the bottles. So much perfume…too little time and money.